Meet PUAIDA, Meet delicate life. PUAIDA, the brand comes from the movie The Devil Wears Prada, in which the heroine Andrea Sachs fights for a delicate and elegant life. So does PUAIDA, who is committed to provide high quality products to customers for an exquisite life. All-rounded customer service is what we always pursue. PUAIDA emphasizes to offer you a thoughtful and joyful shopping experience. 【Natural Bamboo Trays】 Trapezoidal bamboo trays make full use of vertical space to display live potted plants, succulent plants, small cactus and herbs perfectly, meanwhile, they can keep the table clean. 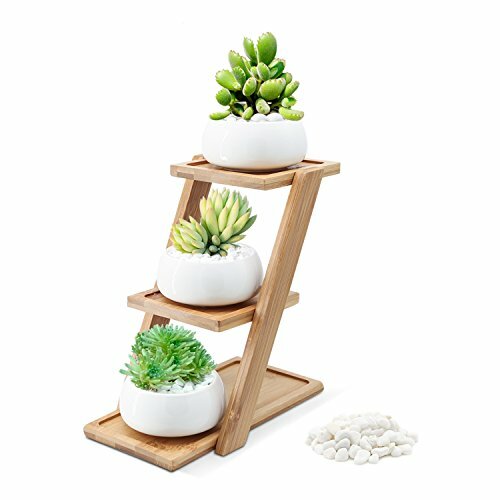 【Modern Gift & Decor】 All the succulent planters are made of superior ceramic which is a green gift and a stylish decor for your windowsill, desktop, home and office. 【Drainage Hole】 The succulent pots are designed with a small hole on the bottom; it can drain off water and protect the roots from rotting. 【Note】Pot size: 3.15*3.15*1.57 Inch; Tray size: 7.28*3.78*8.27 Inch; Set of 3; Plants and Soil are Not Included; Bamboo stand needs to be assembled. 【90 DAYS WARRANTY & REFUND】 100% PUAIDA Satisfaction Guarantee - No worries to purchase.